It’s comforting for returning businessmen. Hey, aren’t you the same bartender from 20 years ago? Photo courtesy of Phil Philerd. Found at Narita Airport, Japan. The guy in the picture got kicked in the nuts. Some things never change. Wait- you changed the sign, didn’t you? The foreign exchange student was arrested and sent back to his home country. Don’t touch me, I don’t know if you changed. Too bad, Bruce-I mean, Caitlyn Jenner! So you had something else to do, while you were sitting there. Is that why he’s been handcuffed? 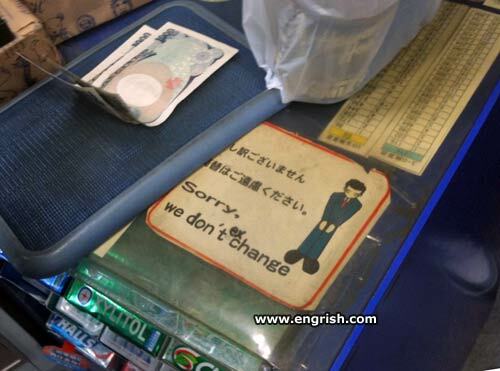 Nope, you need not change at all. Just take them off.